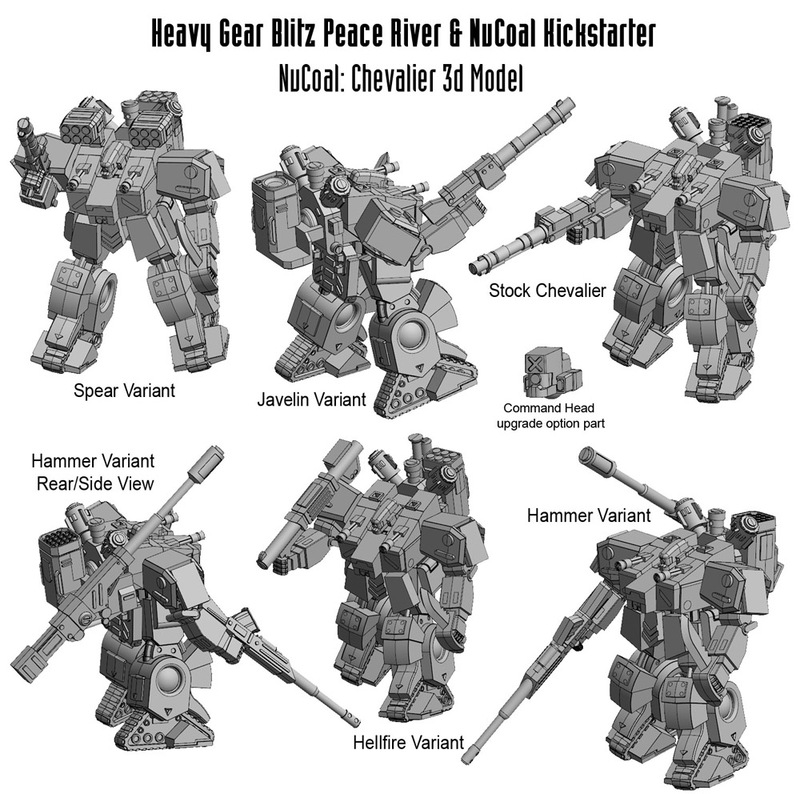 Dream Pod 9: Heavy Gear Blitz Peace River & NuCoal Kickstarter Launch Update and NuCoal Chevalier 3d Model Preview! We are going to need 1 more week to get everything finished up for the Kickstarter launch. We've been working with the 3d modelers, who are finishing up the NuCoal Chasseur, Jerboa, and Chevalier models in Solidworks. The Jerboa still needs a few last fixes to be made to the 3d model before we show it to everyone. As soon as the Jerboa finished (should be this weekend) we'll be able to do the Kickstarter video and launch the Kickstarter the middle of next week (Wednesday Evening April 25th, 2018). Sorry for the delay, but we think its best to wait and have all the final 3d models done and ready to show before we launch. Today we are previewing the NuCoal Chevalier 3d model with images of stock and all variant models, plus the Command Head upgrade option part. Checkout the attached Chevalier and update Chasseur 3d model images showing the stock and all the variant models. The Chasseur's Command Head is still be tweaked, once it finished we'll show everyone. The main thing we changed in this update is we added a slight deeper socket to the hip armor plates for the default position and tracks to the left/right/up/down for player custom leg poses. So you can glue the armor plates a bit more to the left, right, up, or down if you have fun making a custom leg pose. Plus we added 2 new parts a small box and ammo clip part to glue around the hips as desired. We have also added this same hip armor socket style to all the new Peace River and NuCoal models. 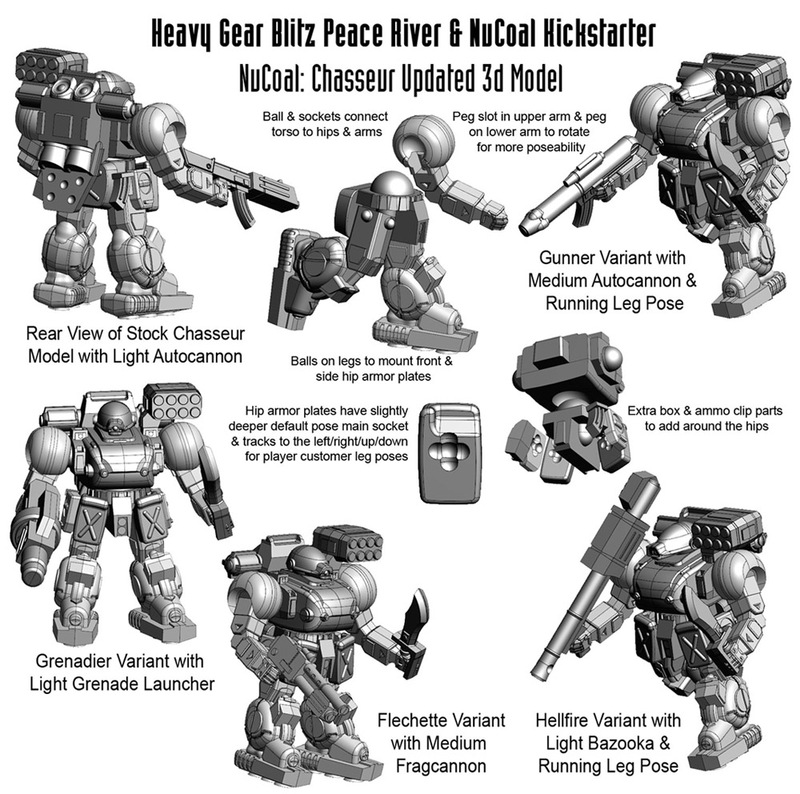 Home › Blogs › Robert Dubois's blog › Heavy Gear Blitz Peace River & NuCoal Kickstarter Launch Update and NuCoal Chevalier 3d Model Preview!